What a convenient off-strip location! What an experience! The Platinum Hotel & Spa in Las Vegas is the absolute perfect, affordable wedding venue. 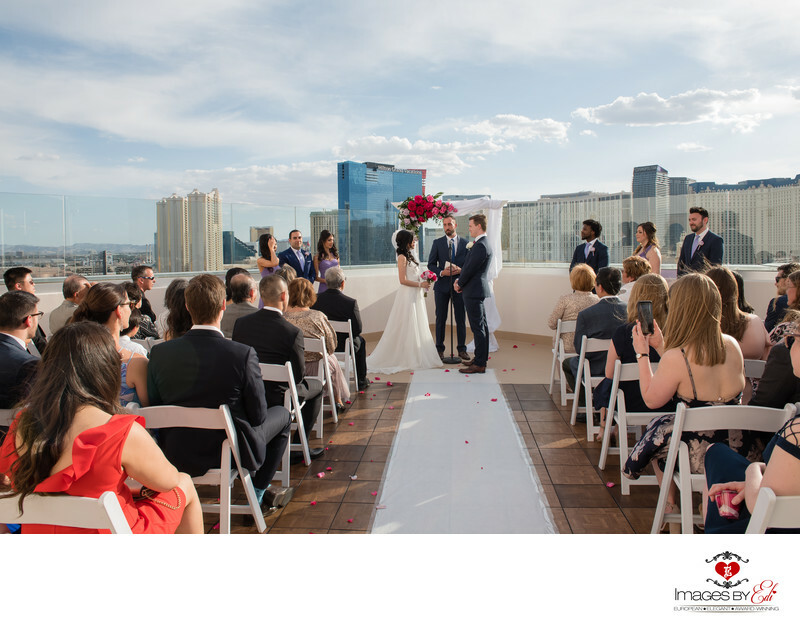 The Misora room and rooftop terrace on the 17th floor with panoramic views of the Las Vegas Strip skyline and the surrounding mountains was the perfect backdrop for this Las Vegas wedding. This photograph features an overview of the Misore roof top terrace wedding ceremony. Sandra Cambray event manager was able to create an amazing custom package for the couple that included everything they asked for, creating the vision of their wedding day dreams come to reality, the ceremony and reception they have always imagined. She was always on top of things and made sure the wedding day went smoothly. She was very professional, flexible, approachable and fun to be around. She always to go the extra mile to ensure every detail was taken care of the wedding the entire time. Part of the wedding reception took place indoors and the dancing part is outdoors on the wrap around terrace, so the guests could enjoy the glitz and glamour of the city lights. Location: 211 E Flamingo Rd, Las Vegas, NV 89169.